Crap, crap, crap I thought as I somewhat but not quite frantically looked from the chart to the parallel runways below me and back again. The controller had asked which runway I wanted to land on–a question I’ve never dealt with in the air as controllers generally tell you explicitly where to go. I asked for 28 Left, was told to make left traffic, and then promptly got my left and right mixed up. As my brain took a big pause trying to figure out how to maneuver to left traffic for 28L as I stared at it from the right downwind for 28R, the controller asked again what I planned to do. Mute for a few seconds as I kicked myself for not asking for the convenient-to-me runway, I swallowed my pride and admitted I was a student pilot on a short cross country solo. Without missing a beat, he asked if I could make right traffic (yes) and if I needed general aviation services (no), before directing me again to choose my runway. Leaving Modesto and heading for Los Banos in my Cessna 182. I chose 28R, bracketed my embarrassment and made a nice crosswind landing at Modesto’s Sham Field. During my taxi back to takeoff, as I tossed water on my desert dry throat, I told myself the mix up wasn’t a huge deal and didn’t need to define the rest of my trip. And then (with clearance, incidentally), I entered the runway one turn too soon to make an inadvertent (but safe and with plenty of runway) intersection take-off. Crap, crap, CRAP! As I climbed, the controller asked “Would you like flight following?” which would mean connecting me to radar service that would follow me to my next destination. 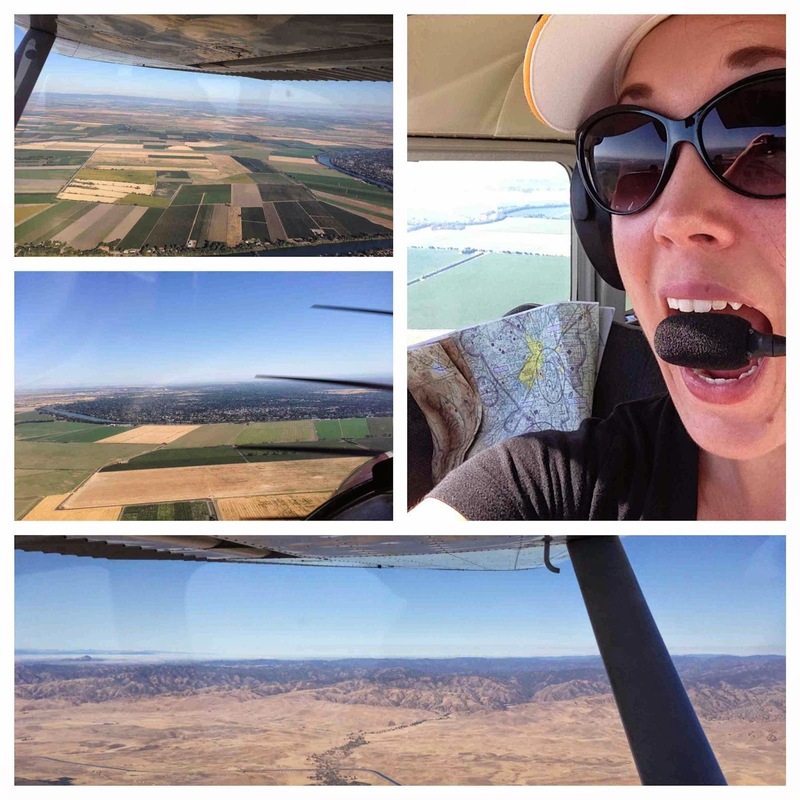 Flying from Los Banos back to Sacramento on a hot summer day. I headed off to stop two, Los Banos, a small uncontrolled airport (meaning no air traffic control tower) southwest of where I’d just landed. Again, I told myself to chill out and went back to marveling that I’d followed my flight plan and successfully navigated somewhere I’d never been all alone. Soon I found myself approaching Los Banos following a glider and a helicopter. I called out my positions, saying I would be circling to enter a left 45* for runway 32. Only I circled to the left, and with an eye on both air crafting landing, and proceeded (like an idiot) to make right traffic for 32. CRAP, CRAP, CRAP. I landed safely and without incident, texted Mr. T and my flight instructor Stan, and took a couple minutes to breathe before heading home. The rest of my flight proceeded smoothly and with no additional errors. I got to the ground and after turning on the a/c (aka, cracking the pilot side window), gave myself a nice goobery round of applause, plus or minus a fist pump. I. Did. It. Despite sleeping only a few winks the night before due to stress dreams, I safely navigated and flew myself to two new places. And I learned a ton. Of course, after debriefing with T and plenty of “hangar flying” later, I understand what I should have done differently. First, I should have practiced interpreting the runway orientations way more on the ground and walked myself through how I would enter the patterns so I didn’t have to think about too much in the sky. 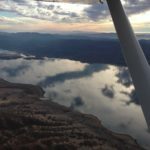 Part of my in-sky issue was being given a choice–something new and different–but mostly, I realized later, I was mixing up left/right and not translating the north-oriented in-cockpit chart while heading southbound. Although I’ve been told “everyone” makes these types of mistakes, this one could have been avoided easily. Incredible little journey with an “OMG I DID IT!!! !” selfie. Second, (and good heavens I know better), when I realized that I entered the wrong traffic pattern at Los Banos, I should have gone around. I had time, space, and no traffic, and therefore no excuse. There are reasons why airports designate traffic patterns, usually due to obstacles, parachuting, or noise abatement. And other pilots coming into the area would likely not be expecting someone buzzing around on the wrong side (although it always behooves you to look every which way for traffic). Although another common mistake, it’s one I could have prevented or at least corrected quickly. 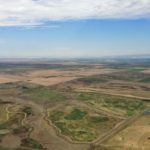 The good news is during my long cross country flight only a couple weeks later, I did not make those particular mistakes again. 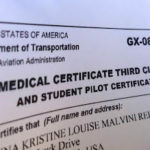 Stay tuned to find out what lovely student pilot lessons I did learn. * This means flying toward the center of the airport at a 45 degree angle such that you can turn and make the roughly rectangular pattern around the airport to land on the correct runway. 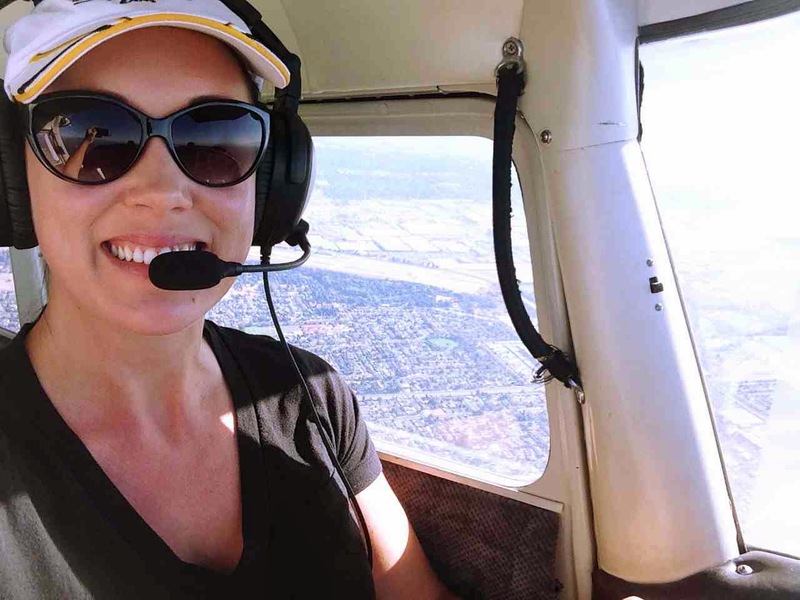 One Response to "Fly Girl in Training: Short cross-country solo flying"
Love this–perfectly exemplifies the way we mistakes when we try something new (and better yet when we try something new, alone). Also, I'm going to adopt the term "bracketed my embarrassment" for future use. I know it'll come in handy.